International Falls, Minnesota, is probably best known for its winter weather. After all, Frostbite Falls is also famous for being the Icebox of the Nation! But all that focus on winter obscures the fact that this area along the Canadian border has a lot to offer visitors throughout the year. Located on the Canadian border, International Falls is almost as far north as you can get and still be in Minnesota. (The state’s northernmost point is the Northwest Angle, which is mostly occupied by water.) This is a landscape known for its forests and pristine lakes sprinkled with rocky islands. Imagine a northern Minnesota lake and, whether you know it or not, you are probably picturing this part of the state. While International Falls is mostly a place that draws outdoorsy types, there are things to do in town too. 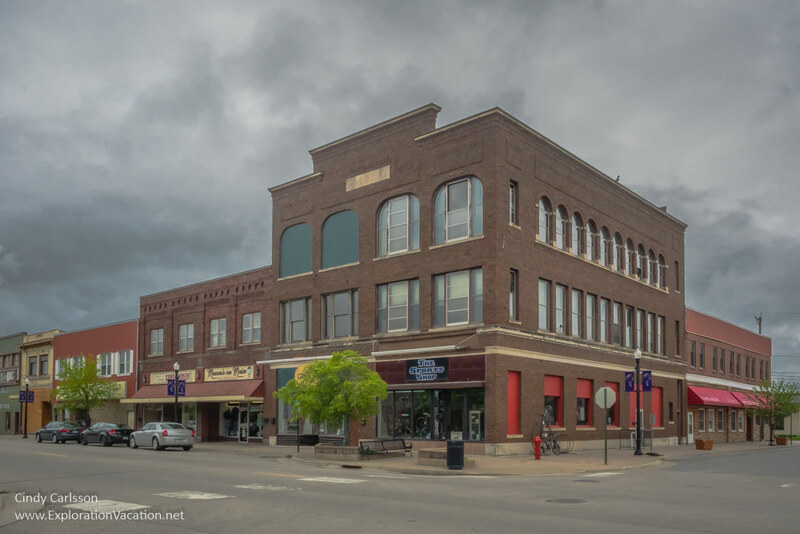 International Falls is home to two museums that share a building: The Koochiching County History Museum and the Bronko Nagurski Museum. At both, excellent curatorial choices make for a fun and interesting visit. As proof, I actually liked visiting a museum about the life of a football and wrestling star! If giant roadside sculpture is your thing, International Falls has a few treats for you. Near downtown, a 26 foot tall Smokey Bear keeps watch in (what else?) Smokey Bear Park. Just around the corner, a 21 foot tall Bronko Nagurski perpetually runs toward an invisible end zone outside his namesake museum. Just a little outside International Falls, tiny Rainer might be hard to spot were it not for Big Vic. The 30 foot Voyageur was created by a local property owner to protest the establishment of Voyageur’s National Park back in the 1970s. These days he seems to invite visitors to take a break in Rainer. And, apparently, I missed a giant walleye wearing a saddle (so you can comfortably ride it) along Lake Kabetogama. There are a few historic buildings right downtown in the historic business district. However, architecture buffs should take a stroll through some of the other older areas of the city. For example, the grand Koochiching County Courthouse is listed on the National Register of Historic Places. But it’s not the only historic building of interest. Walk a little farther to take a close look at the lovely blue/gray stone used in the construction of St. Thomas Aquinas Catholic Church. That stone is a bit of the waterfall for which International Falls is named. When the Rainy River was dammed at the beginning of the 20th century, the stone blasted from the falls was offered to area builders. As you walk around town, keep an eye out for historic houses that also used some of the stone. Ronnings is sort of a souvenir/clothing/sporting goods department store. Whatever it is you don’t need but can’t live without, they have it here . . . and probably for a really good price. The Hideaway has a nice selection of clothing and gifts. A couple of the resorts also have nice gift shops. While there are options for shopping and culture, most people come to International Falls to spend time outdoors. After all, this is a major gateway to the lakes of Voyageurs National Park – the only national park in Minnesota. The lakes of Voyageurs National Park are those of your dreams: vast expanses of water sprouting rocky islands, towering pines, loons, eagles, and the occasional moose. Rainy Lake is the reason most visitors head to International Falls. Since much of Rainy’s shoreline is outside the national park, it is the most developed – and easiest to access – of the park’s lakes. Lakeside lodges provide everything you need to enjoy your time. That’s true whether you are in search of great fishing, hiking, or just some time reading by the lake. The larger lodges also have restaurants (some with excellent food) and all have beautiful views over the lake. The National Park Service has facilities and tourist services on Rainy Lake too. Along with a visitor center, campgrounds, and hiking trails, the park offers lake tours aboard the Voyageur. These tours include a stop at Little American Island to see the remains of the 1890s gold mining operation. 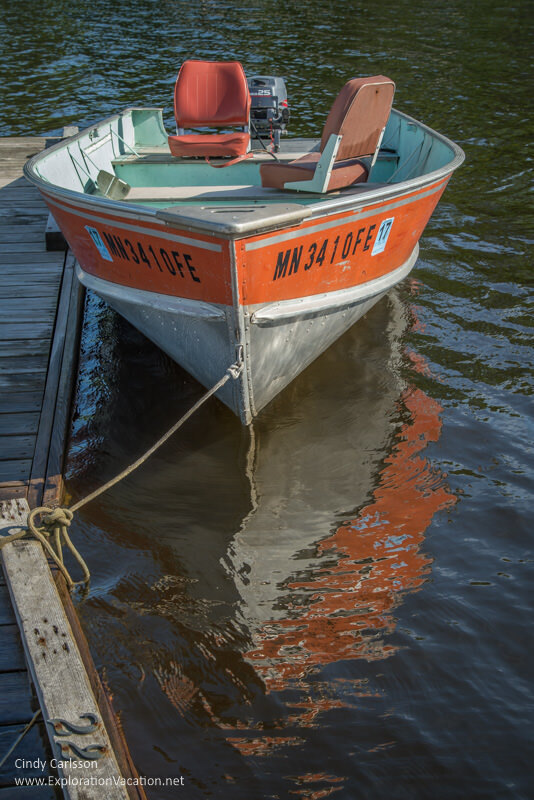 While motorized boats are allowed in Voyageurs National Park, things tend to get quieter as you move farther into the park from International Falls. There are areas with (mostly small) lakeshore lodges, but large areas of the park are only accessible by water. Water taxis can be hired to ferry paddlers and hikers to remote areas that lack road access. If that sounds a little too outdoorsy for you, there are other options. The park service runs a tour that takes visitors to the historic Kettle Falls hotel. Those wishing to spend a little more time exploring this remote area without pitching a tent can book a room and stay for a day or two. Gardeners won’t want to miss the Ellsworth Rock Gardens. These elaborate perennial gardens have been partially restored and come alive with color in summer. However, even when not in full bloom, the gardens’ interesting stonework constructions are worth seeing. While the shores of the Rainy River are fully developed in International Falls (where the river powers the downtown mill), they change character west of town. Once past the line-up of rural homes, visitors reach Franz Jevne State Park. This is a quiet park that seems perfect for fishing and bird watching. Like a number of other Minnesota state parks, Fanz Jevne seems intended more for local use than as a destination for visitors to the area. I would have liked to visit the nearby Grand Mound historic site (one of several ancient burial sites in the area), but it has yet to reopen after public access was closed in 2007. Don’t forget to bring your passport or border card like I did. You need it to visit the Canadian side of the Rainy River and border lakes. Fort Frances, Ontario, is directly across the bridge from International Falls. It looks like you should be able to just walk there, but you need a passport or border card. Since I forgot my passport at home, all I could do was look longingly across the short bridge. A town of about 7,000, Fort Frances appears to have a small downtown, a local history museum, historic logging tug boat, and plenty of parks. More than anything, Fort Frances offers additional lake access. Like the shores of Rainy south of the border, the Canadian lakeshore is home to a number of resorts. If you look at a map of Voyageurs National Park, you’ll see that only a portion of the border lakes are in the park. The rest are in Canada. This entire watery wilderness is accessible via boat from Voyageurs National Park, assuming you have the proper documents with you. Despite my dislike for winter weather, International Falls is a year-round destination for many outdoor sports enthusiasts. The area has well-developed services for fisherman, paddlers, snowmobilers, skiers, and hikers. However, the information here is geared toward warm weather visitors. International Falls is located about 5 hours driving time from the Minneapolis/Saint Paul metropolitan area. The Falls International Airport offers regular direct passenger service between MSP and International Falls through Delta Airline. Rental cars are available at the airport, but should be booked in advance. Boat rentals are available through a number of resorts and rental businesses. Canoes and rowboats are also available through the National Park Service. The National Park Service offers several lake tours using motorboats, as well as guided canoe tours. To enter Canada you will need to take your passport or passport card and visit Canadian customs. The only exception is for boaters entering Canadian waters. In this case, a CANPASS Remote Area Border Crossing (RABC) allows entry without a stop in customs. 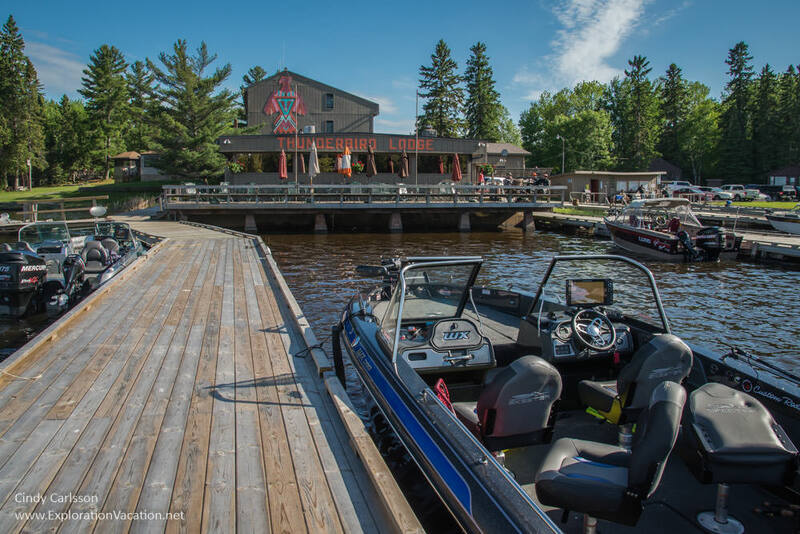 There are basically two options for lodging and dining in International Falls: in town or by the water. The following offers some general guidance for making your decision, but the quality of both lodging and restaurants can change fast. Check Check TripAdvisor (affiliate link) to see what’s hot and what’s not. My first choice would always be to stay by the lake. However, you’ll need to book well in advance if you want a certain level of comfort and an affordable price. None of the Rainy Lake resorts are really huge and many are quite small, some with just a couple of cabins or guesthouse units. Most lodging around here seems designed for either family travel (parents and kids sharing a unit) or fishing groups (a bunch of guys sharing a unit). Relatively few units seem designed with couples in mind and they book quickly. Many lower-priced units are also self-catering (bring your own towels and sheets), so keep that in mind as well. There are very few private rooms or homes available on either Airbnb (friends link for a first-time Airbnb customer discount) or VRBO. The majority of these are on or around Lake Kabetogama. The larger lodges have-full service restaurants with great views of the water. There are a few units available in Rainer, many of which are right along the water. Lodging in Rainer lacks the out-in-the-woods feel of the more isolated resorts, but has the advantage of being close to a wide range of dining options. It has the disadvantage of being very close to the railroad tracks. International Falls has the usual run of highway-side chain hotels at the edges of town. Rates are generally lower than comparable rooms by the lake. International Falls has a lot of rail activity, so expect to hear trains at night in most highway locations. There are a variety of restaurants in town, most of which we didn’t try because we generally ate at the resorts near where we were staying. However, I can vouch for the wonderfulness of the Coffee Landing. It’s in a historic building right downtown and the chai and breakfast treats are delicious. The International Falls Convention and Visitors Bureau’s website at Rainylake.org has loads of interesting and useful information to help you plan your trip. Once you are in town, stop by the International Falls Chamber and Visitors Bureau for up-to-the-minute news and information. This is also a good place to stop if you want the back-story on area attractions or suggestions for less well-known sites worth visiting. Ask for Pete, who will happily share some good stories based on what he’s learned about the area over the years.